That’s Intriguing #78: How Can I Prepare for a Presentation so I Can Walk In With Confidence? A client, who was an executive for a Six Sigma organization, was preparing for an important medical conference. If he did right by his audience, he and his organization stood to win millions in contracts. Have you ever been to a medical conference? Most everyone there is brilliant. Unfortunately, that brilliance doesn’t always translate to the platform. The programs are often highly technical and everyone’s power-point slides are packed with facts, numbers, complex case studies and graphs. Lots of graphs. Furthermore, my client was speaking on the last day. At that point, participants’ eyes were going to be glazed over. I kept asking him questions about his personal interests to see how he could pleasantly surprise his audience, in the first minute, with something they didn’t expect. Something startlingly relevant that would get their eyebrows up. Something that would quickly convince them he was worth their valuable time and mind. I asked if he had any hobbies. 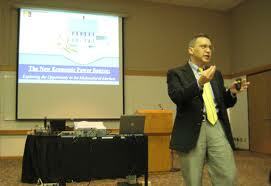 I now knew how he could title and format his presentation so it captured and kept interest – from start to finish. Guess what that title was? And yes, he featured the signature image on his power point slides and the iconic “Dda-dum” tone to reveal his important points. He had his audience at hello. Best yet, he kept this intriguing theme throughout his presentation. At the end, he was surrounded by participants giving him their business cards and requesting more information on how they could work together. He had proven to these decision-makers they could trust him to prepare in advance and deliver intriguing, relevant insights and recommended actions that were relevant to their needs. Are you preparing for an important presentation? If so, you can start by asking yourself the following questions. That will kick-start your preparation process. Then, if you want to POP! your presentation and stand out from the crowd; contact us at Sam@SamHorn.com to schedule a complementary 15 minute appointment. We’ll discuss your upcoming communication, including your goals and the audience’s needs. We’ll explore how we can work together to tailor a presentation that positions you to walk in with confidence because you’ve done everything possible to prepare yourself for a win-win experience. Want to get your audience’s eyebrows up? Clarify your W’s so you can customize your communication in advance and make it relevant and intriguing for that particular audience and situation. Filling out this form can help you walk in with confidence because it will be clear you’ve done your homework and you know what you’re talking about. That will help engage and impress people in the first 60 seconds. They’ll be motivated to give you their valuable time and mind and they’ll be inspired to care about what you care about. Who are you communicating to? Who’s the person you’re trying to connect with, convince or persuade? Describe that person so vividly we can SEE them in our mind’s eye. Give enough detail so we get a sense of what they look like, what they’re feeling, where they’re coming from, why they might be resistant, and how they feel about us. Man? Woman? Age? Mom of 3? CEO? Tired? Impatient? Angry? Perfectionist? Skeptical? Where will this communication take place? Will you be speaking in a boardroom, ballroom or your boss’s office? Will you be meeting someone at a bark park or ball park? Will they be reading your copy online? Will you be talking on the phone, plane, elevator? Is this at a trade fair, networking function or business luncheon? At a 5 star hotel? U.S.? China? Will this be at 4:30 pm on a Friday and everyone’s impatient to get out the door? 1:30 pm after a big lunch and everyone’s sleepy? 8 pm and people are tired after a long day? April 15th when people are focused on taxes? January 1st and people are thinking about New Year resolutions? Go a sentence deeper. You’ve already identified your goals and what you hope to achieve … but WHY? You hope this company hires you SO you get to work for a business you believe in where you’re getting paid to do work you love? You want this company to donate $10,000 to your non-profit BECAUSE then you can give scholarships to 10 students? You want a more compelling elevator speech SO you feel more confident meeting new people at conferences? Good for you for taking the time to fill that out. Your clarity about the W’s will help you customize your communication so you’re better able to quickly capture the favorable attention of your group. Now, either get a copy of my book POP! so you can make your insights and examples more compelling or contact us at Sam@SamHorn.com so we can help you tailor this presentation so you capture everyone’s interest in the crucial first 60 seconds.